There is an obvious problem with the IDs noted (back row, five players shown but six names given). 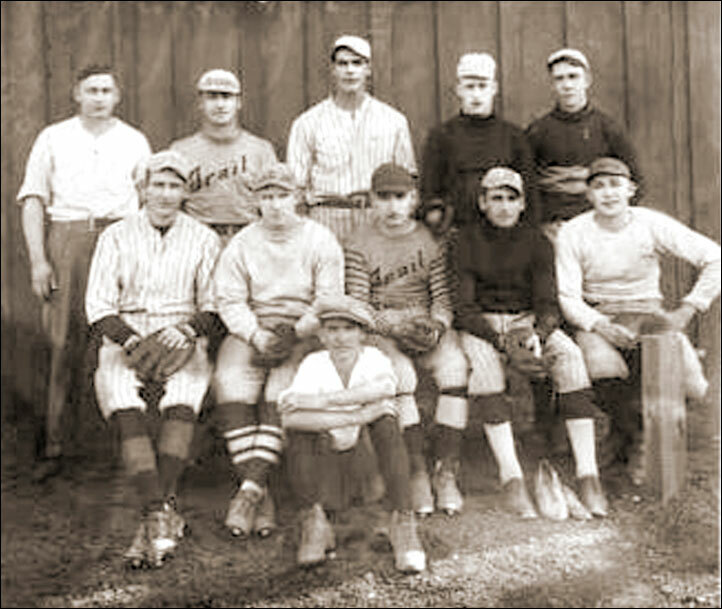 Back Row: Joe Vanatter, Bill "Mystery" DiPasquale (Third Base), Jim Hanson (First Base), then two of - A.W. "Gus" McDonald (Left Field), Jack Morrison (Shortstop), C.P. Reddick (Second Base). Front Row: Cliff Morgan (Centre Field), Fred Lauriente, Hank Lauriente (Right Field), Leo Letcher (Pitcher), Ralph "Tuffy" Garland (catcher). In front: Jackie Hansen (Mascot).